This is White Pine. Each bundle of needles has 5 needles. It's winter here now and very cold with lots of snow, so some of these things I won't be trying until this spring and will do updates and include more photos then. 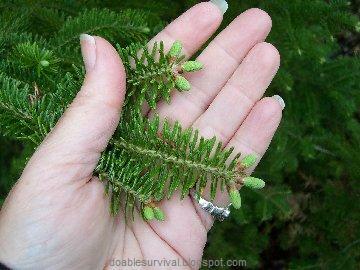 All Pine, Fir, and Spruce are edible; but not all evergreens are edible, like Yew. As far as the needles go, use younger ones that are brighter in color if you can. New growth tips in spring are even better. Pine needles are full of vitamin C and vitamin A, 4-5 times the vitamin C of oranges and lemons. This helped to save early explorers from scurvy. Native Americans used tree parts for tonics and medicinal tea. 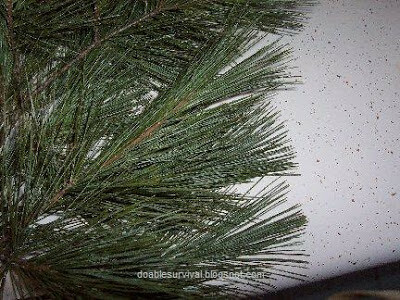 Pine needles are said to soothe sore throats, cough, and lung congestion and help with cold and flu, among other things. White pine seems to be the preference. It's said that Monterey Pine has an orange citrus flavor. Soft pines like the White Pine and Pinyon are said to have a less harsh pitch flavor than the hard pines like the Ponderosa or Monterey. Note: Many sites give warnings not to consume evergreen tree parts if pregnant or breastfeeding. Large quantities of pine needles have been known to cause miscarriages in livestock. water sugar, honey, maple syrup, lemon, or anything you want to add. 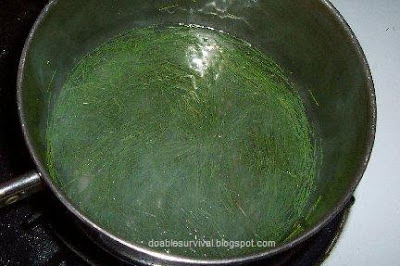 Use around 2-5 tablespoons of needles per cup of water. It's not an exact science, and the recipes vary a lot; so just play with it and figure out what your preference is. You can wash the needles first. I personally don't think it's necessary. Bring the water to a boil and then remove it from the heat. Add the needles and let them steep for 15-20 minutes. I used a coffee filter to strain the needles out. Some recipes say to bring the water to a boil and simmer the needles for 15-20 minutes. It's said that, if you let the needles simmer, more of the health benefits are released into the tea but that it also releases more resin into the tea so that it may taste more harsh, sort of turpentine-like. Again, use your own judgment and figure out what you like best. You can lightly crush the needles first with a rolling pin or chop them. I found what worked best for me was to just cut them up with the kitchen scissors. I cut them off the branch too. That way I didn't get the little brown sheath at the base in there, although it doesn't really matter. According to Wikipedia, the vitamin C is not destroyed by high temperatures. I added a little honey. I first tried a mix of Spruce and Scott pine as that is what is surrounding my house. It tasted pitchy to me, not very good. I then went up the road a little way and got some White pine needles. Not bad. Keep in mind that I don't like tea to begin with, but I could easily see drinking this in a survival situation. If I liked tea, I would probably drink it now and then for the health benefits. 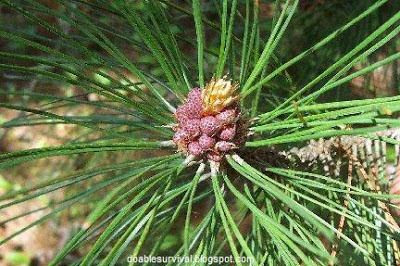 Pine needle tea can also be used as an antiseptic wound wash.
"First, the amount of vitamin C is reported to be five times the amount found in a lemon, which is 83.2 mg, according to nutritional data web site. That means a cup of pine needles would yield more than 400 mg per cup of brew. Vitamin C is an antioxidant and an immune system booster. It also improves cardiovascular system functions, improves skin and eye health, which alone accounts for many of the positive results from using the tea, such as a cure for scurvy." Second, pine needle tea is high in fat-soluble vitamin A, an antioxidant beta-carotene, which is needed for healthy vision (especially in low light situations), skin and hair regeneration, and red blood cell production! The vitamin A explains a few more of the nutrition and health claims, but certainly not all of them. There is more to the tea than just vitamins A and C. There are many components to consider with swallowing a cup of pine needle broth!" This can be used as an alternative to the more expensive Balsamic Vinegar. Sterilize the jar. (I use the microwave or oven. For the microwave, put about 1/2 inch of water in the bottom and heat the jar for 2 minutes. You can use the oven also on low or boil it.) Some say to pack the jar with the needles and others say a "handful". (I think 1/2 to 2/3 or so full of needles is good.) You can wash the needles first if you wish. Some recipes say you don't have to, and I agree. 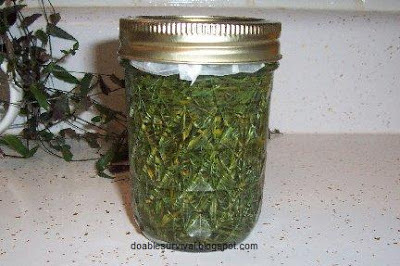 Bring the vinegar to a boil, shut off the heat, stir in the sugar until it dissolves, let it cool, and then pour into the jar with the pine needles. Some people have reported some growth of mold if the vinegar wasn't boiled or you could buy pasteurized vinegar. If using a metal lid, put waxed paper over the opening first so the vinegar won't erode the lid or use a plastic lid. Let it sit in a dark place for 6-8 weeks. 6-8 weeks to try it. I'll do an update then. Update: I tried it after 4 weeks, and it was pretty strong. might want to try this. Pine vinegar is rich in flavonoids, vitamins, and minerals. You can use it to make salad dressings, flavor soups and stews, or cook down into a reduction sauce for chicken or fish. 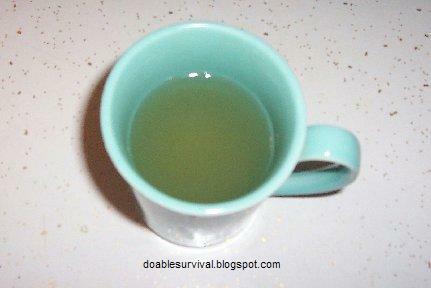 It's supposed to help your immune system and ward off colds and flu. Young growth of pine in the spring is edible right off the tree. Some think it has the hint of a citrus taste and a resin taste that will get stronger as the new growth matures. It can be dried and powdered to use as a spice for a unique flavor. 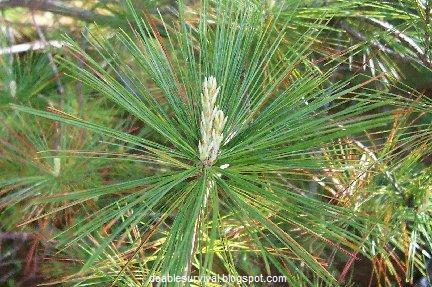 Pine needles can be used for bedding, shelter, roofing. Pine needles can be soaked in olive oil for a time for a relaxing massage oil. Resin is the part that gets hard and is darker in color. Sap is the water and sugar part that can be eaten. 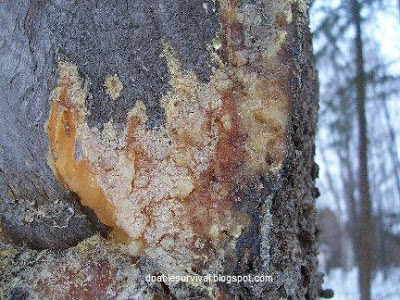 Sap/Resin can be used to start fires and make a torch and is said to deter bugs. It can be used to waterproof boots and clothing. It can even be used as a glue. It can be used to seal wounds and is said to have antibacterial and anti-inflammatory properties. Resin can be powdered and used in heated fat/oil to make ointments. The clear-white colored part is the sap. 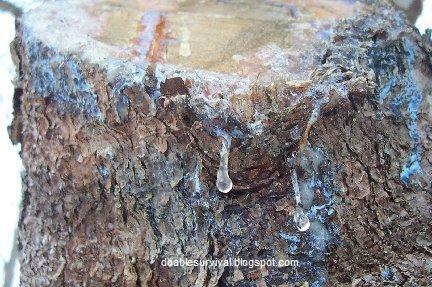 I actually tried eating one of these clear drops of sap; and OMG, it was horrible! lol I had to go in the house and eat some crackers! I "bit the bullet" for my blog, and it tasted like I thought it would. It was a Spruce tree so probably a less desirable sap; but still, I don't plan on eating sap ever again. It's different if you are in a true survival situation. You do whatever you have to do. 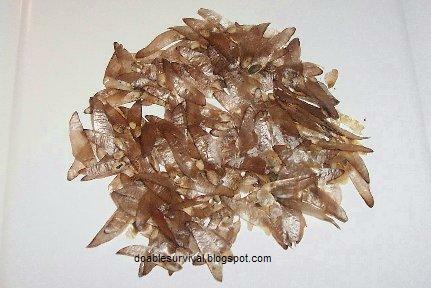 All pinecone seeds are edible and can be eaten raw or toasted over a fire. They contain thiamine, protein, and vitamin B1. Shake the seeds out. If the cones are closed, heat and drying will open them back up. They close when they get wet. Here in the north, the seeds aren't really big enough to mess with; but if you can put a bunch in a bag or something and shake it hard, you can get some without too much effort. from the ones in the next picture. the actual nut I could get from these. 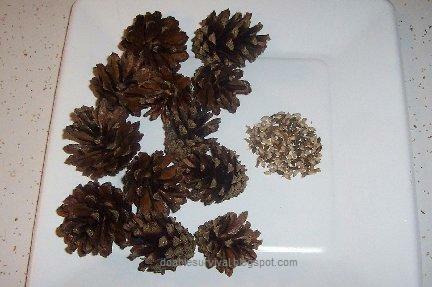 In the spring, the male pine cone flowers/cones can be boiled in water or baked and eaten. The pollen can be shaken out and used as a flour substitute and to thicken soups, etc. Pine cones can be used as a bobber while fishing. Red pine, male pine flowers/cones. The bark on young pine twigs is edible. Peel it off in layers with a knife. As far as the mature trees, you can eat the layer of bark under the outside hard layer. You can fry it over a fire until brown and crispy. Add a little salt. I tried a small amount of the bark from this young white pine branch, and it didn't taste very good; but again, you do what you have to in a survival situation. I heard someone on TV, I thought Les Stroud from Survival Man, say that pine needles are a good source of water in a survival situation when you chew on them. Now that I look for something on that, I don't see anything; so I'm not sure. Feel free to leave a comment or suggestion below. I just stumbled upon your blog......... very cool... I love it! Lot's of great frugal idea's and a 'hands on' kind of gal. suggestion for the pine resin chewing gum is to cut the heated pine sap resin with 50 % honey, add a pinch of clove and blend well......let cool and enjoy.